Castle Vardulon: The Thirty-Fourth-Greatest Panel in the History of Comics! The Thirty-Fourth-Greatest Panel in the History of Comics! This isn't a superhero torturing a criminal for information - which is a pretty common sight in the golden age, truth be told - it's a superhero taking a criminal to the police, then offering them advice on the best way to torture him for information. 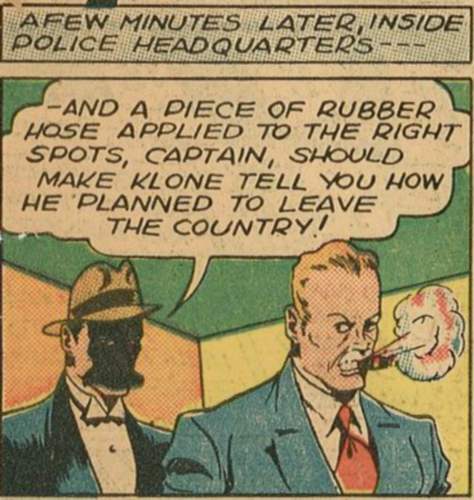 Join us next time for more adventures of The Clock - Enhanced Interrogation Consultant!